Ashville, N.Y.-based Fairbank Farms is recalling approximately 545,699 pounds of fresh ground beef products that may be contaminated with E. coli O157:H7, the U.S. Department of Agriculture's Food Safety and Inspection Service announced on Saturday. FSIS became aware of the problem during the course of an investigation of a cluster of E. coli O157:H7 illnesses. Working with the Centers for Disease Control and Prevention (CDC) and state health and agriculture departments, FSIS determined that there is an association between the fresh ground beef products subject to recall and illnesses in Connecticut, Maine and Massachusetts. 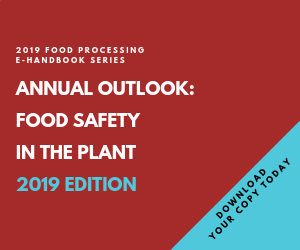 FSIS is continuing to work with the Massachusetts Department of Public Health, the Connecticut Department of Public Health, other state health and agriculture departments and the CDC on the investigation. Anyone with signs or symptoms of foodborne illness should consult a physician. Each package bears the establishment number "EST. 492" inside the USDA mark of inspection or on the nutrition label. These products were packaged on September 15 and 16, 2009, and may have been labeled at the retail stores with a sell-by date from September 19 through 28, 2009, unless otherwise noted above. Consumers should ask at their point of purchase if the products they have are subject to recall. The products were sent to distribution centers, intended for further distribution to retail establishments in Northeast and Mid-Atlantic regions. When available, the retail distribution list(s) will be posted on FSIS' Web site at http://www.fsis.usda.gov/FSIS_Recalls/ Open_Federal_Cases/index.asp.